Most Reverend Nicholas DiMarzio, Bishop of Brooklyn, regrets to inform you of the death of Mrs. Lucille Joseph, mother of Reverend Lucon Rigaud, a priest of the Diocese of Brooklyn who is presently ministering as Parochial Vicar of the Church of St. Nicholas of Tolentine, Jamaica. Mrs. Joseph died Saturday, December 15, 2018 in Haiti. All arrangements will be taking place in Haiti. If you wish to send condolences, please mail to Reverend Lucon Rigaud, St. Nicholas of Tolentine Church, 150-75 Goethals Avenue, Jamaica, New York 11432. Most Reverend Nicholas DiMarzio, Bishop of Brooklyn, regrets to inform you of the death of Reverend Patrick G. Burns, a priest of the Diocese of Brooklyn. Father Burns was born on March 17, 1961 in Brooklyn, was ordained to the Priesthood on May 23, 1992, and died Friday, December 14, 2018 at Holy Name of Jesus Rectory. Father Burns served the Diocese of Brooklyn as Pastor of the Parishes of St. Michael (Brooklyn) and St. Martin of Tours-Fourteen Holy Martyrs (Brooklyn), as Administrator of Blessed Sacrament (Jackson Heights), as Parochial Vicar of the Parishes of St. Catharine of Alexandria (Brooklyn), Blessed Virgin Mary Help of Christians (Woodside) and St. Francis de Sales (Belle Harbor). He also served the Parishes of St. Leo (Corona) and SS. Peter and Paul (Brooklyn). Additionally, he ministered with the Office of Parish Giving. Father Burns was a member of the Priests’ Purgatorial Society. All priests are invited to concelebrate the Liturgy. Please bring your diocesan vestments. If you wish to send condolences, please mail to his brother, Mr. Michael Burns, at 31 Roosevelt Walk, Breezy Point, NY 11697. 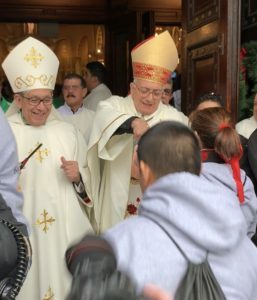 The Most Reverend Nicholas DiMarzio, Bishop of Brooklyn, in partnership with Timothy Cardinal Dolan of the Archdiocese of New York, is reminding New York Catholics that December 17th, the Monday before Christmas, is Reconciliation Monday. From 4 p.m. to 8 p.m., parishes throughout the diocese and archdiocese will be open for walk-in confessions. The goal of Reconciliation Monday is to encourage Catholics to receive the sacrament of Reconciliation in preparation for Christmas. This day also allows the faithful to confess their sins in anonymity. “One of the advantages is that you do not have to go to your own parish, as you can go to another Church and be unknown if there is some embarrassment in knowing the priest who will hear your confession. This is the time when the priest is merely an instrument of God’s grace and that the real absolver is Jesus Christ, Himself,” said Bishop DiMarzio. 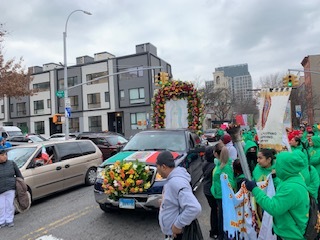 Today the Diocese of Brooklyn celebrated the feast of Our Lady of Guadalupe at the Co-Cathedral of St. Joseph, 856 Pacific Street, in Prospect Heights, followed by the traditional torch walk to 35 Catholic Churches throughout Brooklyn and Queens. The day’s events began at 10:30 a.m. with Catechesis. 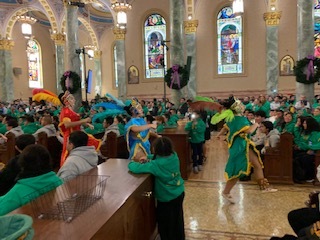 At noon, Mass was celebrated in Spanish by the Most Reverend Nicholas DiMarzio, Bishop of Brooklyn, and concelebrated by 20 priests as well as auxiliary Bishop Octavio Cisneros, who delivered the homily. Following Mass, Bishop DiMarzio blessed and lit about 35 torches of the faithful. 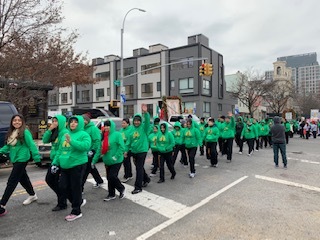 After that, more than 2,000 participants departed for their pilgrimage to participating parishes throughout Brooklyn and Queens. There are five routes; three will end in Queens, and two will terminate in Brooklyn. The group of pilgrims represents, in its vast majority, the Mexican-Catholic population of Brooklyn and Queens. According to the 2015 National Census, there are nearly 200,000 Mexicans living in Brooklyn and Queens. Attached are pictures of the colorful celebration. If you need higher resolution images or a video clip, contact Adriana Rodriguez at (646) 241-9805 or at arodriguez@desalesmedia.org. 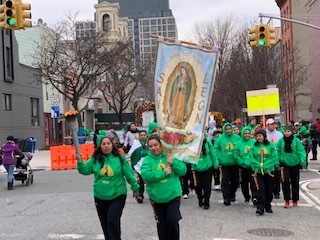 On Wednesday, December 12, the Diocese of Brooklyn will celebrate the feast of Our Lady of Guadalupe at the Co-Cathedral of St. Joseph, 856 Pacific Street, in Prospect Heights, followed by the traditional torch walk to 35 Catholic Churches throughout Brooklyn and Queens. The day’s events begin at 10:30 a.m. with Catechesis. 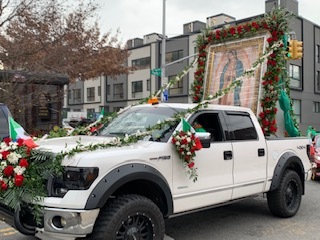 At noon, the Mass will be celebrated in Spanish by the Most Reverend Nicholas DiMarzio, Bishop of Brooklyn, and concelebrated by 20 priests as well as auxiliary Bishop Octavio Cisneros, who will deliver the homily. Following Mass, at about 1:30 pm, Bishop DiMarzio will bless and light the 35 torches of the faithful. At 1:45 pm, more than 2,000 participants are expected to depart and make their pilgrimage to participating parishes. There are five routes, three will end in Queens, and two will terminate in Brooklyn. This event is organized by Reverend Jorge Ortiz-Garay, Director of the Mexican Apostolate. For more information, contact Adriana Rodriguez at (646) 241-9805 or at arodriguez@desalesmedia.org. Most Reverend Nicholas DiMarzio, Bishop of Brooklyn, regrets to inform you of the death of Mrs. Carmen Josefina Luces, mother of Deacon Fernando E. Luces, a permanent deacon of the Diocese of Brooklyn who is presently ministering at St. Rita, Long Island City. Mrs. Luces died Monday, December 3, 2018 at SS. Joachim and Anne Nursing and Rehabilitation Center, Brooklyn. If you wish to send condolences, please mail to Deacon Fernando E. Luces, 96-08 57th Avenue Apt. 8J, Corona, New York 11368. On Tuesday, December 11th at 5:00 p.m., Most Reverend Nicholas DiMarzio, Bishop of Brooklyn, will bless the life-size Nativity crèche and light a giant Christmas tree at Grand Army Plaza in Prospect Park, Brooklyn. Parishioners from Brooklyn and Queens will fill the plaza for the annual kickoff to the Christmas season in Brooklyn. The festivities will be hosted by actor Anthony Mangano, and include performances by the St. Saviour Gospel Choir, 14-year-old budding opera singer Diana Marie Paunetto and cabaret singer Charlie Romo. The 35-foot Balsam Fir Christmas tree at the Soldiers’ and Sailors’ Memorial Arch is decorated with thousands of colored lights to represent the Diversity of Brooklyn. The tree and Nativity will be on display until early January. Tomorrow’s tree lighting event is made possible by DeSales Media Group, the Communications, and technology arm of the Diocese of Brooklyn. On December 6, 2018, at 7:30 pm (doors open at 7 pm), the Co-Cathedral of Saint Joseph, 856 Pacific Street, Brooklyn, will host a live Christmas Concert co-hosted by Currents News Anchor, Liz Faublas and Anthony Mangano, actor and host of City of Churches. The concert will feature Emmy Award Winning Fox News Anchor, Kelly Wright. Wright is also an accomplished recording artist, who has performed on programs featuring Shirley Caesar, Cissy Houston, Bobby Caldwell, the late James Brown, and more. Also performing at the concert will be Anthony Mangano and Diana Marie Paunetto, a 14-year-old Opera singer who hails from Bensonhurst and has performed at many parades and festivals in the area. A coat drive will also be held at the concert. Everyone is invited to donate either new or used coats and other warm clothing for St. Dominic’s Homeless Outreach Center.